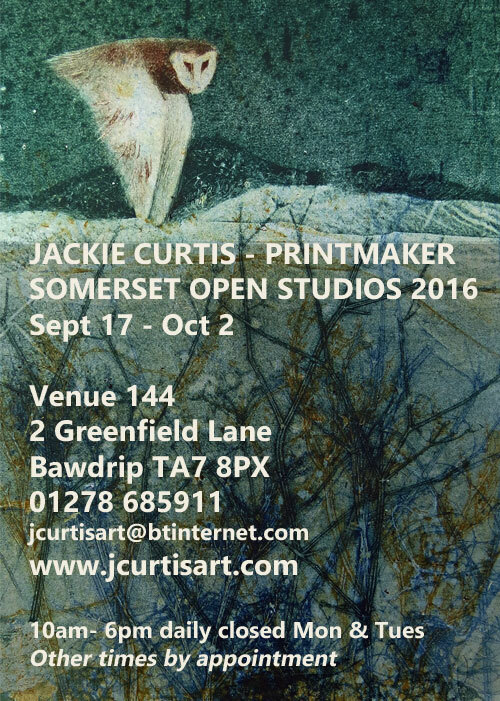 My Studio was open in Somerset Art Weeks from Sept 17th to Oct 2nd. Thank you to everyone who visited and to all those who helped me out with Art Weeks! There was a selection of recent work across a variety of printmaking techniques both framed and unframed works and a wide selection of cards. I am an innovative printmaker with a love of the natural world which provides both inspiration and materials for my printmaking. I enjoy the spontaneity and un-predictability of monoprints building movement into the ink with sticks, rags, feathers and plants. In contrast I also have a passion for more precise printmaking techniques producing structured bold designs and patterns in linocuts, woodblocks and reduction prints; especially woodblocks that build on the natural grain and shape of the wood. I will be at hand to talk about my printmaking techniques; to talk about materials and blocks.